Written by Scriptonomics Team on July 25, 2018 in action, adventure, animation, Biopic, Historical Biopic, Character Driven, Child-Lead, Comedy, Crime, Drama, family drama, Fantasy, horror, Machine Learning, mystery, neo-noir, romance, science fiction, Special Effects, Sports, supernatural, thriller, Unproduced, War, Western, Revisionist Western. Your script is made out of locations, action snippets and your characters’ dialogue. In the previous guide you looked at the locations you used and how the number of unique locations used affect the complexity of the production and profitability of your story. Here we are going to look at how much screen time and dialogue you give your unique characters and what implications it has on your movie’s actor’s and character potential. What character appears the most in your story? Is it the protagonist? How much does your antagonist appear? Does your antagonist speak more than he or she appears? Having large dialogue segments when appearing would indicate to the audience that the character is important and is a tool for the writer to push the plot forward through the dialogue. Do you have a lot of supporting characters or a lot of driving characters? How much of the dialogue do your background characters (what we call “others”) take and what implications does that have on your budget? In this document we are going to take a deeper look at how much dialogue versus appearances previous films had and look at some roles that even won awards. Screenwriters use characters to drive the conflict and push the story forward, but characters are also the writer’s tool to empathize with the audience. The characters you’re crafting need to have enough screen time and enough dialogue for them to play their role in the world that’s shaping up, but also for your audience to get to know them and build a bond with said character. But, with a recommended 100 minute screen time as the ideal, a screenwriter has to be surgically precise on which character the audience sees, when, for how long, and with whom they see them with. Focal Character: The characters the audience follows. Driving Character: Characters that speak more than they appear. Contextual: Characters that appear more than they speak. “Extras”: Background characters that don’t appear or speak enough to play a big part. Supporting: Characters that speak and appear approximately the same amount. A “focal character,” as in the character the audience should be following, serves as a sanity check. Typically, your hero should be the focal character as visually represented by having either the most appearances, the most dialogue, or often the most of both. The five most significant characters are ranked in importance to the story by appearances, dialogue, and relation to other characters. Much of this information can tell you who your focal character is. We’ll take a look at the characters other than the leads, the supporting characters, and how they shape the lead and the story. Sometimes, a character in a supporting role can assume the role of a “driving character”, defined by the potency of their relationships with the lead character. If a character has more dialogue than appearances in a story, then they may be a driving character. Driving characters, not quite the leads, will often be of vital importance to the direction the story takes. A momentous window in the leads’ lives, stories with strong supporting characters offer leads perspective, guidance, and yes, challenges. These strong supporting characters demonstrate such importance to the direction of the story, that they, as driving characters, often fuel much of the leads’ motivations. Non-pivotal or “contextual characters” are closely identical in their number of appearances onscreen and spoken dialogue as supporting characters. Statistically, their total number of appearances and the total dialogue they speak in the story don’t show too much of a difference from each other. They, however, often serve the themes and plot of the story as supporting characters. Lead characters need allies or counterparts that follow them through the buildup of challenges and obstacles that they will face in the duration of the story. Supporting characters play a significant role in the story by providing assistance to the themes and plot of the story. Background characters aren’t truly personified, because of limited screen time, but are crucial to driving the story forward. Background characters, those that don’t make up the top 10 characters in a story and as individuals speak less than 2% of the dialogue spoken, are represented in the Story-Scanner as “Others.” The percentage size of “others” in appearances affects the total cast size and therefore the scheduling complexity and budget. The number of “others” in dialogue distracts from the main characters and increases budget, as speaking roles are more expensive than non-speaking roles. Let’s take a look at some popular movies from various genres to get a better idea of how others have written their script and see how we can use Story-Scanner to find trends in the importance of characters to stories for your writing. In the ensemble piece, Little Miss Sunshine, we get to follow Olive’s literal and figurative journey as a pageant princess, when she must be in California to compete in the Little Miss Sunshine beauty pageant. Having only their yellow Volkswagen bus, and the entirety of their family, the Hoover family must band together so that Olive realizes her dream. While we all hope for the best for Olive, it is her father, Richard, who, after failing to find success as a professional motivational speaker, makes all of the major decisions in the story. This would make Richard the focal character. With 19.8% of all character appearances, Richard has the most onscreen presence of all the other main characters in the ensemble. And with 28.9% of all dialogue spoken, he speaks the most as well, putting him in the category of a focal character. Alan Arkin, who plays Grandpa, earned an Academy Award for Best Actor in a Supporting Role. Do you know what kind of character Grandpa would fall under? If you thought “contextual character,” you are correct. Statistically, his number of appearances amongst all characters and the dialogue he spoke overall are very similar, and don’t deviate too much. Plus, his supporting role helps push the plot forward and elevate the story’s themes. Audiences grappled with Grandpa’s addiction, and were catalyzed by Richard’s perseverance. 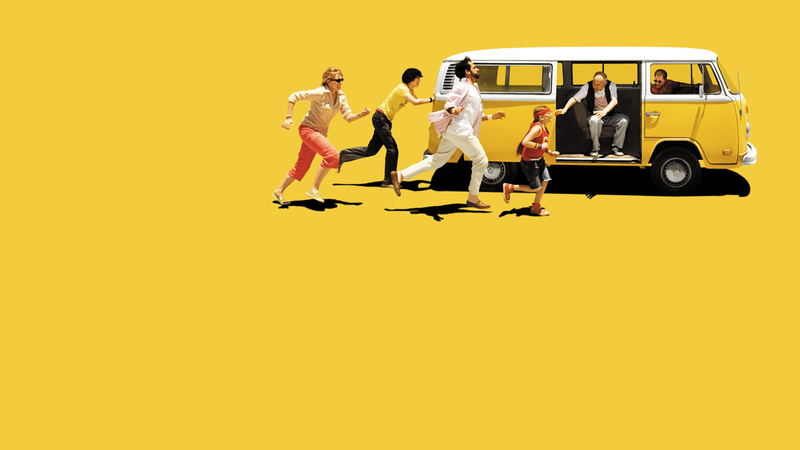 With a mixed cast ensemble of well-known actors like Steve Carell, Alan Arkin, and Greg Kinnear and some lesser knowns like Toni Collette, Paul Dano, and Abigail Breslin, Little Miss Sunshine’s wonderfully relatable and quirky Hoover family drove audiences to the theaters, taking its $8 million budget and turning its character driven ensemble cast into a profitable $100.5 million. Sometimes, leads, often the most important characters, appear in a large portion of a story, but speak much less than their time on screen. That stoic leadership appears in Blade Runner 2049, where in it, LAPD replicant K appears in 43.8% of all character appearances in the story, but only speaks 23.1% of the overall dialogue spoken. He’s tops in both categories, which not only suggests that hard-boiled detectives of the future know procedures well, but that they don’t feel the need to speak much while performing them. It is also worth mentioning that Blade Runner 2049’s cinematographer, Roger Deakins, took home the award for Best Achievement in Cinematography, and John Nelson, the Visual Effects Supervisor, with Best Achievement in Special Effects, showing the team’s complimentary effort toward the “look” of the world in the future. Made with a budget of $150M, Blade Runner 2049 managed to lose money at the box office, only grossing $92M, but not without gaining technical recognition for its production and critical acclaim as a sequel. Despite its critical success, the sequel didn’t garner wide audience excitement and anticipation considering its execution of sci-fi expertise, because it was less character driven and more action driven, but did couple the star power of Harrison Ford and Ryan Gosling to close a chapter to the widely respected and loved franchise. 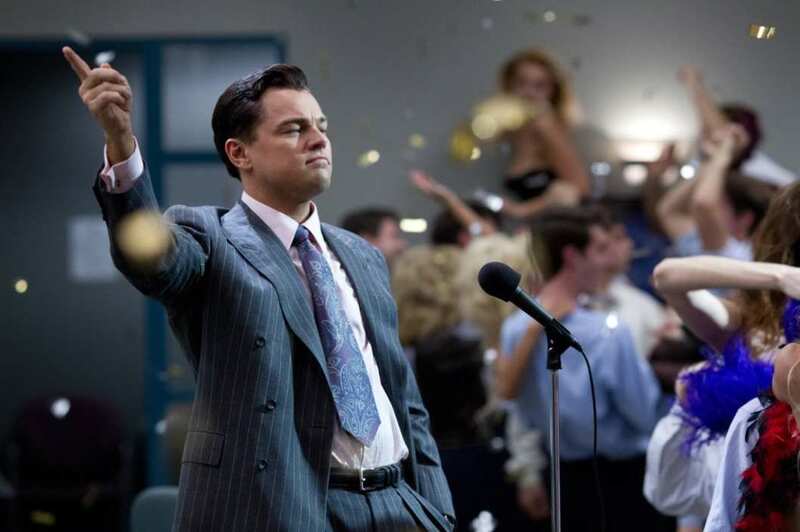 In something like a biopic, where the protagonist will naturally dominate, like the Martin Scorsese-directed, The Wolf of Wall Street, the sleazy and sultry, fast-paced lifestyle of the enigmatic lead, financial scammer, Jordan Belfort, appears in 46.5% of all character appearances, a charismatic persona with whom to scoff, sneer, and profoundly participate with, while his dialogue takes up 62.5% of all dialogue in the story, aided by his confessional voice-overs explaining his big time thievery of small investors. Already appearing in much of the story, Jordan, too, is number one in both statistical categories, and his persuasive dialogue makes him a genuine lead with very much to say, and, as we find out, very little to sell. Terence Winter, the screenwriter, definitely puts the money where his character’s mouth is, and helped earn Leonardo Dicaprio an Oscar nomination for Best Actor in a Lead Role. Winter, himself nabbed a nomination in the Best Adapted Screenplay category. With the box office success of The Wolf of Wall Street, audiences were treated with seeing a lavish lifestyle rarely told on film, about a specific moment in financial investment history during a time of public apprehension of financial loss. Jordan Belfort provided a tell-all, no holds barred glimpse into the life of a crook. Dicaprio’s performance gives intimate details of how to do criminal things and get away with it, while still inspiring a rags to riches tale. The film, made on a budget of $100M, grossed $392M, showing the audience’s interest in the workings of the criminal mind. Balancing the characters in such a way certainly paved the road to The Wolf of Wall Street’s success, compared to 2015’s Steve Jobs, the biopic about Apple’s late co-founder starring Michael Fassbender, which only grossed $34.4 million after having a $30 million budget. In Citizen Kane, following the death of a publishing tycoon, news reporters scramble to discover the meaning of his final utterance. And while the film’s present day takes place after Charles Foster Kane’s death, he is undoubtedly the main character. Through flashbacks and interviews, we see more of Kane’s life than we ever do of the reporters or narrators which guide our journey into his life. So while Kane may be the focal character of the film, other characters also play a large role. Other characters make up 34.9% of all character appearances, beating out Kane who only appears in 19.6% of the script. Yet Kane’s presence as a main driving character comes through when you see his dialogue comes in at number one with 28% of the screenplay. “Others” characters then come in second with 26.2%. The number of other characters, particularly “others” characters with speaking roles is important to note from a budget perspective. By including so many characters which take up so little screen time on their own, much of the budget has to go to paying the numerous actors to fill these roles. The other notable character between these two graphs is Leland, who speaks 11.1% of the time yet only appears in 5.5% of the screenplay. This affirms him as a driving character, while someone like Thompson with 4.03% of the dialogue yet 5.81% of appearances serves a contextual role. Thompson’s our narrator, with little backstory or motivation of his own besides guiding the viewer into Kane’s life. Citizen Kane, thinly veiled as a live portrait of the family fortune of newspaper magnate, William Randolph Hearst, gave audiences first glance of director Orson Welles’ artistry and cinematic authorial moment, despite attempts to destroy the film and its maker. It did poorly at the box office, with Hearst’s efforts to block its exhibition and lost much money despite the publicity surrounding its production. Nebraska, a road dramedy, tells the story of the Grant family that uncovers familial bonds hidden away for years, while half-heartedly accompanying the father, Woody, across state lines in order to claim a nonexistent $1 million prize. The mother, Kate, amongst Woody and their two sons, appears in 8.19% of the story, yet speaks 16.6%, just less than ‘others,’ (the accumulation of all the side characters combined) and David, her youngest son and a focal character, who appears 27.3% of all character appearances and speaks 28.1% of all dialogue. This would identify Kate as a driving character, helping move the story forward. June Squibb, the actress who played Kate Grant, won the Academy Award for Best Actress in a Supporting Role, and the screenwriter, Robert Nelson, earned a nomination in the Best Screenplay category. The budget for Nebraska was $12M and grossed $24M at the box office. The film, a road movie about a father and son, barely made money for its investors, which is not to say audiences didn’t like its picturesque view of the American MidWest. Despite its poor box office performance, its ensemble cast gave the film its charm and June Squibb’s Oscar win helped get audiences to the box office with word of mouth. In The Theory of Everything, the biopic of famed physicist Stephen Hawking, his budding relationship with his earliest romantic interest, Jane, ignites the story of the young physicist’s struggles with attaining academic recognition for his theories while battling disease. Brian, a fictitious character filling the role of best friend and roommate to Stephen, appears in 5.68% of all character appearances and his lines makes up 7.77% of all spoken dialogue in the story. His contextual role plays a part in the initiation between the two soon-to-be star-crossed lovers. Similarly, Jonathan, although based on someone real, appears in 6.31% of all character appearances and his dialogue comprises 7.28% of all spoken dialogue. His character appears later in the story to find Jane Hawking’s affections apart from the ailing Stephen, and with everyone’s mutual consent, becomes her partner. These two characters, Brian and Jonathan, while they have more dialogue than action, there isn’t too much of a difference to make them driving characters. With no large disparities between their appearances and dialogues in the overall story, Brian and Jonathan would be considered non pivotal or contextual characters. Although one of them has been created and the other character real, they both still help with the unfolding of the romantic subplot of the Hawkings, thus serving the importance of humanizing Stephen and his growth as a physicist. 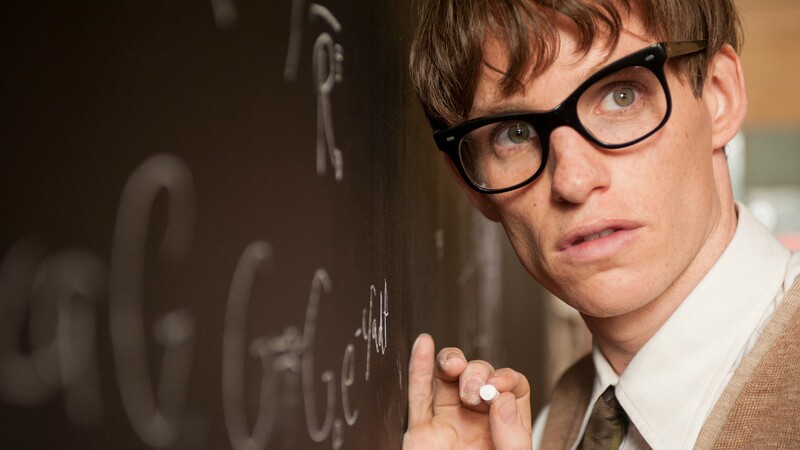 The Theory of Everything gave audiences a love story of a scientist struggling to advance his theories in the academic world. Audiences fell in love with the characters after getting to know them, and contextualizing their relationship with two supporting characters, the elevation of their romance became a hit with audiences. The studio bet big on the actors and found success with the formula. With a $15 million budget, the film grossed $123.7 million at the box office. Toy Story, Pixar’s breakout hit about a group of talking toys depicts Woody, the leader of the toys and his festering jealousy, as Buzz, a cool new spaceman toy begins to take the spotlight. Woody’s plan to get rid of Buzz quickly backfires after his immediate regret. Along the way, the two encounter a myriad of other toys, which is why it’s not surprising that the characters with the most appearances are simply named “other”. “Other” characters make up 38.3% of the appearances with Woody and Buzz getting 16.6% and 10.6% respectively. This of course includes the three eyed aliens from the Pizza Planet claw machine, Sid’s horrific self-created toys, and various other characters who come and go. However, Woody still gets his fair share of the dialogue, boasting 33.6% with the “others” getting 21.3% and Buzz taking a fairly standard 16.3%. With this data, we can establish that Woody is the focal character, as we’re following his story throughout the film. Buzz, of course, would be a driving character as his dialogue is more prevalent than his appearances. The “other” characters are then considered contextual and they appear a significantly throughout the movie, but have very little to say. 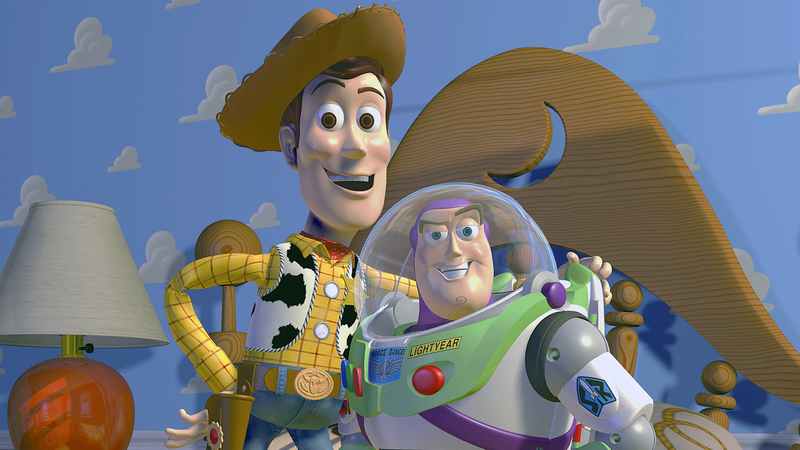 Released in 1995, Toy Story was the first full-length feature film to be fully computer animated. With its colorful, vibrant characters that were literal toys, parents were rushing their kids to the theatre to catch a glimpse of film history. With animation giant Disney behind them, Pixar’s success was assured from the start making $373.6 million out of a $30 million budget. Get Out, Jordan Peele’s writing and directorial debut in film, follows Chris, a young African American man who visits his white girlfriend’s family for the first time. His increasing unease comes to a boil when he discovers the seemingly nice Armitage family has some disturbingly sinister motives. Chris, the focal character, gets 28.4% of the appearances and 24.9% of the dialogue, with the various “other” characters getting 23.2% appearances and 22.3% dialogue. These characters are the various white neighbors who share in the Armitage’s ominous actions. Rose, Chris’ girlfriend and a contextual character, appears the third most with 16.6% of the pot and speaks 12.1% of the time, just a hair under her father’s dialogue with his 12.2%. Get Out does a great job of subverting expectations from the characters. Dean, the Armitage patriarch and a driving character, has fewer appearances than Rod, a minor character, yet he (Dean) surpasses every other main character except Chris in dialogue. While Missy, a driving character who appears 4.8% of the time and has 7.78% of the dialogue, is a massive catalyst in Chris’ festering unease after she hypnotizes him. With Get Out, Jordan Peele earned the Academy Award for Best Original Screenplay, for a film made with a budget of $4.5M that turned a hefty profit of $255.5 million. This success can likely be attributed to the highly likable characterization of Chris and Rod, as well as having a villain to rally behind with the easy-to-hate Armitage family. Grossing $254 million at the box office from a budget of $5 million, the film provided audiences with a picture that filled a vacuum in the horror genre that modern audiences could relate to. Released at a time when strains in race relations have become all too apparent, Get Out displays a horrific portrait of a family with intentions that are about as devious as one can be with a grotesque tradition behind closed gates. With the sports biopic I, Tonya, the story of the famed infamy of American Olympian, Tonya Harding, Tonya’s mother, Lavona, plays a decisive part in her daughter’s success as a professional figure skater. Appearing fragmentally within the sensational story about hypocrisy, paranoia, and violence, Lavona’s speaking parts make up 12.3% of the total script, more than double her appearances onscreen, which total to 6.06% of the script, showing the importance that she has on the hero’s rise and fall. 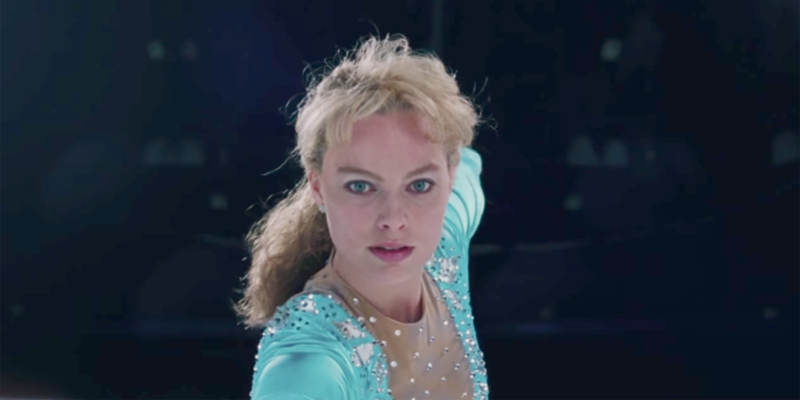 Lavona’s influence over Tonya’s arc is a clear example of a driving character stealing the show from the focal character. Allison Janney, for her performance as Lavona Harding, won the Oscar for Best Actress in a Supporting Role. Margot Robbie gives a glamorous performance that audiences could adore while learning the beginnings of the media’s fascination with their heroes. Tonya Harding, for a moment, was an American hero on the world stage, and when she fell, her notoriety was heightened to star status. To see these controversial figures and their story on the big screen was a massive influence on the $11 million budget film’s successful $53.9 million box office. 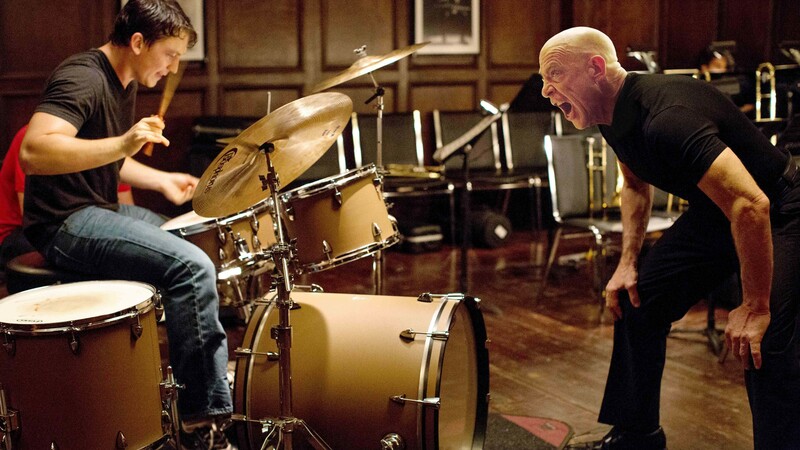 Whiplash, the rhythmic musical drama written by Damien Chazelle, follows Andrew Neiman through the prestigious halls of jazz musicianship as he struggles to impress the conservatory’s demanding conductor, Terence Fletcher, enough to secure the core drummer spot for the school’s jazz orchestra. Fletcher appears as the third most visible character in the story (after ‘others’ at 28.5%), at 16.6%, but speaks close to half of the script’s overall dialogue at 49% making him an incredibly forceful driving character. He indeed drives the story, creating not only a hostile environment for Andrew, who appears 35.7% of all character appearances and speaks 23% of all dialogue, but also his ambitious students in the claustrophobic practice rooms. Surely enough, JK Simmons, won the Academy Award for Best Actor in a Supporting Role. For his writing, Damien Chazelle earned an Oscar nomination for Best Adapted Screenplay. Audiences, presented with a look into the unpopular world of jazz music, and watching an abusive, demanding, and out of control teacher abuse his students, were given an opportunity to witness something unfamiliar in an intense, fast-paced setting like New York City. These interesting and realistic characters helped turn a meager $3.3 million budget into a $49 million box office success. In Alex Garland’s drama/fantasy, Ex Machina, Caleb, a programmer at a influential internet company gets the chance of a lifetime when CEO, Nathan, invites him to his secluded estate to perform a Turing test on Nathan’s top secret AI named Ava. A film with little characters depicts a very standard plot breakdown. Caleb, the protagonist gets 31.2% of the appearances and 39.1% of the dialogue, with Nathan barely behind him at 24.4% appearances and 35.8% of the dialogue. Ava, the soft spoken AI appears 15.2% of the time and takes 19.4% of the dialogue. It is interesting to note that the various automated voices controlling Nathan’s futuristic home take up the rest of the dialogue, excluding the only other human character, a pilot named Jay who appears only 1.2% of the time and gets a measly 2.74% of the dialogue, making him a contextual character. Caleb is our focal character, as he is the one who is always interacting with Nathan and Ava, our two driving characters. Caleb, Nathan, and Ava each try to play puppet master in their own way. Caleb attempts to free Ava from Nathan’s manor, Nathan tries to keep Caleb from finding out about his abuse of the former AIs, while Ava has been playing them both the entire time as she pulls their strings to trick Caleb into freeing her as she leaves him locked in the facility. 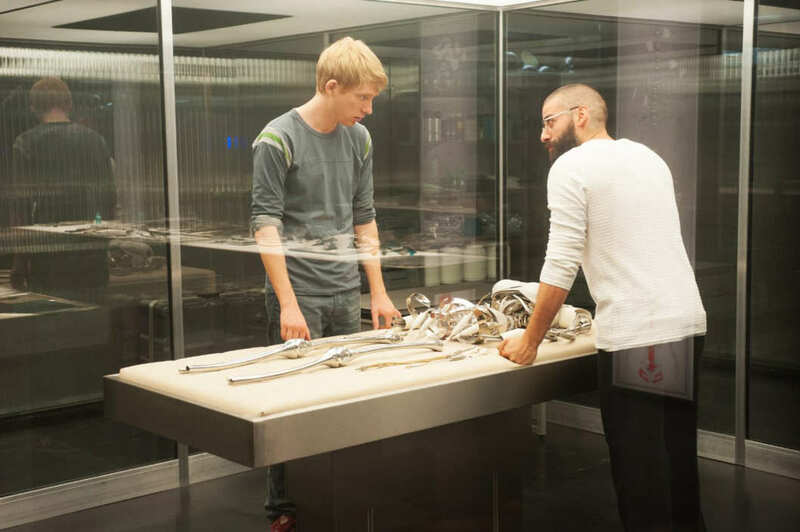 With only a handful of characters, Ex Machina did not have to rely on paying an ensemble of actors to tell its story and could instead focus on making the most of its $15 million budget. However, audiences may have possibly been turned away from the film’s uneasy tone and lack of relatable characters, making this film’s $36.9 million box office a minor success at best. In 10 Cloverfield Lane, a girl struggles to learn the truth after waking injured up in a man’s fallout shelter, only to have him tell her the world has ended. The film primarily revolves around three characters, and we see that represented in the plots as “others” compose 0% of the spoken dialogue. Despite Michelle being the focal character and appearing in 47.2% of the screenplay, she has only 27.7% of dialogue in this draft. This matches with her having a generally quiet personality. Nate, who appears 14.8% of the time, also has significantly less dialogue at 9.92%, cementing himself as a contextual character that adds another layer of complexity to the mystery of the film. Howard on the other hand, appears in 38% of the screenplay but accounts for most of the dialogue with 62.4%, showing that he’s a driving character. A possible explanation for the large disparity of spoken lines in Howard’s favor could be that he is the one with the most knowledge about what is happening. As a result, most of the exposition is given to Howard as he plays a large driving role in the story with his expansive, explanatory dialogue. One could also argue the disparity between Michelle and Howard’s dialogue sheds light on a larger issue with many scripts, a lack of the female perspective. While more scripts are able to pass the Bechdel test, many still privilege the dialogue of male characters regardless of whether they have a lesser or equal role in the film. Here, Michelle’s the main character, yet speaks half as much. Both Michelle and Howard are present for the majority of the screenplay, but Nate only exists from scenes 27-72 with the screenplay taking up 122 total scenes. A small cast often means a small budget and 10 Cloverfield Lane is no exception and being a sequel to an already successful low budget film only further helped. With a strong female lead rivaled by a haunting villain you love to hate, 10 Cloverfield Lane’s characters and status were able to turn $15 million into $110.2 million. In IT, Bill and his six friends must overcome their own personal fears to battle the murderous, bloodthirsty clown known as Pennywise. But because the film contains so many characters, 32.2% of all dialogue is in the hands of “others” characters not readily significant to the story. Focal characters, Bill and Beverly, then only have 15.2% and 8.11% of dialogue and 13.6% and 7.67% of the appearances, respectively. Richie, who appears 7.43% (5th) of the time gets 8.77% (2nd) of dialogue as the crass comic relief character is more of a contextual character whose dialogue relieves the tension in otherwise bleak moments. And then Ben, who only appears in 5.69% (6th) of the script speaks 7.75% (4th) of the time which identifies with him being a driving character. Stanley serves as the inverse of Ben as he appears 7.67% of the time and only speaks 5.16% of the time which identifies him as being a contextual character. The most notable disparity between appearances and spoken lines comes through Pennywise, who only actually appears in 1.98% of the screenplay but takes up 7.18% of the dialogue. As a result of him having more dialogue than appearances, you can see that the villain Pennywise is one of the focal characters in the screenplay. As an ensemble film, it’s interesting to note how similar many of the dialogue and appearance breakdowns are to each other. In these kinds of films, writers want to give ample time for the entire cast to feel fleshed out and worth including in the film. That said, it’s difficult for audiences to connect with a film without a clear protagonist, so as a result, we see Bill take the lead. While the film switches between characters a lot, the whole narrative and emotional weight of the film is structured around Bill’s perspective. IT drew audiences prepared to watch kids unnerved by the lack of response from the presence of an evil dressed as a clown, knowing that the ensemble cast would eventually win. With its ensemble of relatable and diverse characters combined with being an adaptation of a popular horror film released close to Halloween, IT was able to rake in an impressive $700.4 million with its $35 million budget. You’ve just looked at 12 examples of how characters shape a story and its themes and saw the different ways to break it down by using the Story-Scanner. Whether it be a biopic focusing on one character or an ensemble piece bringing together multiple characters, a big budget with a lot of background characters, or a small film with a few characters, the Story-Scanner can provide you important data to help you elevate the characters in your story. If you have a story with particular themes in mind or a mixed genre with specific needs, the Story-Scanner brings together many vital character statistics so that you can bring together the elements necessary to get exactly what you want from the characters in your story. When looking at your five most important characters, you can select any character, whether they be your hero, villain, buddy, mentor, or love interest and figure out if they fit the mold of a “focal character”, “driving character”, “contextual character”, or “other.” Remember, your focal character would be the main focus for the audience to follow in the story. They often have the most dialogue of all the characters and the most appearances of all characters in the story. Do you remember who your driving character would be? This character speaks more dialogue than the number of times they appear. Not necessarily your hero, they can play a strong supporting role, aiding the hero in their quest. How about contextual characters? Contextual characters have almost even dialogue and appearances, helping your plot move forward and your story’s themes to emerge. Do you know who your background or “other” characters are? They don’t appear or speak enough to play a big part in your story, often falling below 2% in dialogue spoken amongst all of your characters and do not make up any of the top ten characters. So you have it all down in your head and on paper but haven’t yet run your screenplay through our Story-Scanner. Try running it through the Story-Scanner to see how your screenplay’s characters shape up with Scriptonomics’ precise statistics and data. If a driving or contextual character doesn't fit their mold consider adding to their dialogue or appearances. With these examples, much painstaking labor was needed to make everything work in terms of story, character, and genre. If you examine the data closely enough for your story, you could piece together how your screenplay manages all of its working parts to make it a wholly unique artwork. Part of getting responsive audiences is the uniqueness of the relationships onscreen and how they effectively narrate the story told. Most of the examples we talked about had compelling characters played by such outstanding actors and actresses that when word of mouth spread, especially during awards’ season, more audiences came out to see these great stories on film. The roles these characters filled within each story often worked alongside the budget constraints that were called for each film and they were able to become effective at unfolding the plot and pushing the narrative and its themes. Where do your story’s characters fit in terms of genre, plot, and theme? Biopics will usually have a focal character that speaks the most dialogue and has the most appearances of all the characters. Scripts with ensemble casts will appeal to wide audiences with a diversity of characters on the screen to elevate the themes of the story. Microbudget horror scripts take the opportunity to terrorize audiences with characters that are put in locations involving tense situations, relying on a tone that seeks to surprise and thrill audiences. If you want to learn more about how the Story-Scanner can help you with your story, read the next blog to find out how character appearancers in scenes can effect audience engagement.